Starting off our second day in NYC we had access to the Breakfast Buffet which was located in the hotel’s main restaurant. It had enough vegetarian options that were safe to eat along with scrambled eggs, which was nice. The most memorable part of this experience was running into the cook who came out to replenish the scrambled eggs, and he (as many people do) took a look at my husband and I and became curious about how we got married, if the both of us were Muslim, whether we were converts, and the usual questions we get. We’re very used to this now so we had a friendly chat with him, and turns out that he was an African Muslim himself and he was just all sorts of delighted to meet us and hear our story. 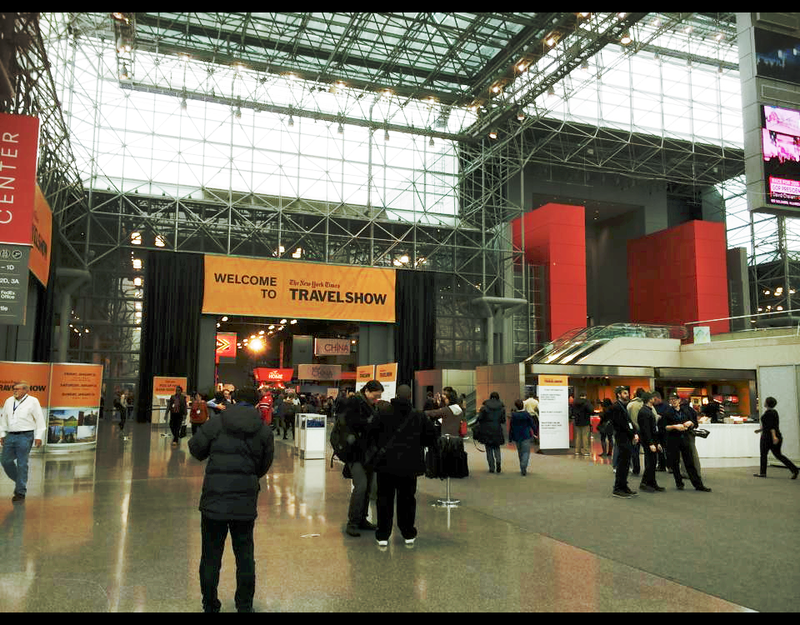 Next, we headed to the Jacob K. Javits Center for the New York Times Travel Show. 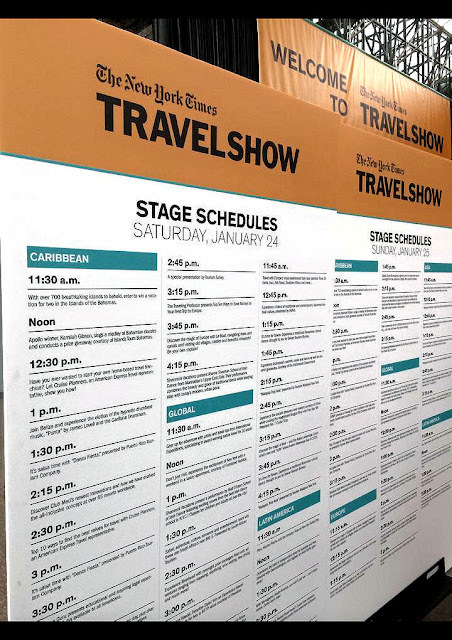 This is the ultimate must-attend event for all Travel enthusiasts, and my husband was like a kid in a candy store. There were booths set up with almost every country in the world giving out freebies, travel brochures, and tons of information about their respective country. We collected everything we could get our hands on and developed a library of travel brochure gold, but focused mainly on Asian countries, which is our next destination planned for the end of the year inshaAllah (God willing). Click here to see my Facebook post about these brochures. 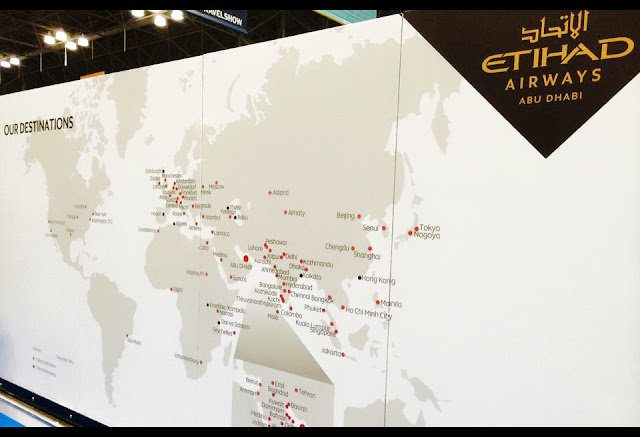 They also had different airlines showing off their new improvements to their services, and the coolest one by far was Etihad Airways’ display, which included a replica of their deluxe “Residence” and “Apartment” suites on the plane which you could enter and see for yourself. 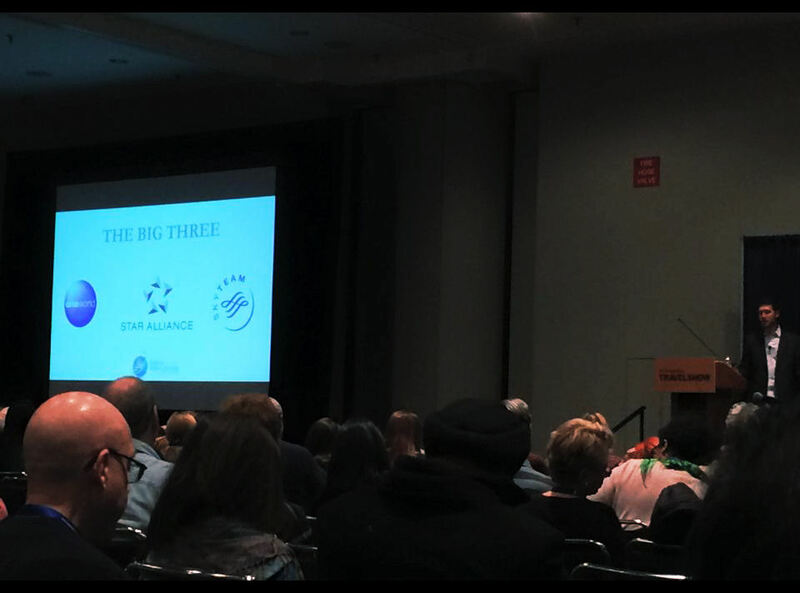 One of the best parts of the Travel Show was the presentations and featured panelists, so we attended one about maximizing your collection and use of travel points among the biggest three airline alliances. There are so many more opportunities to gather miles in the states, as they have more credit card programs and generally just twice or three times as many promotions as we get in Canada. Hopefully in a few years we’ll get as many opportunities as them. Our next stop was lunch at New York’s famous Kosher Deli, Ben’s Kosher Deli & Restaurant. A full review will be coming up soon, so stay tuned! 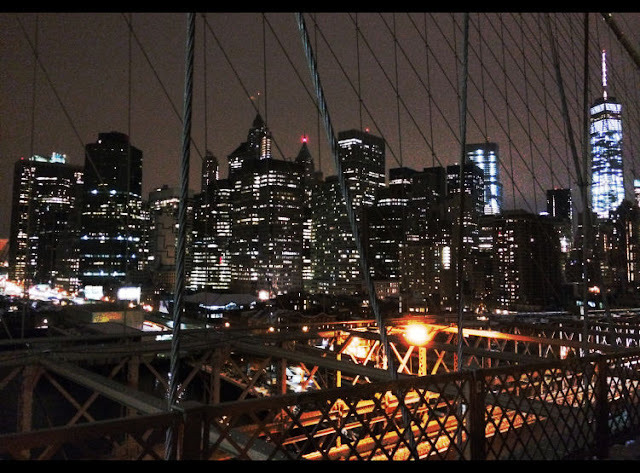 With our tummies full, we headed on a cold wintery subway commute to the Brooklyn Bridge at night time, and entered from the Manhattan side’s Pedestrian walkway. Route: You can take the N or R subway lines to City Hall station, then walk across the city hall park path to the Pedestrian Entrance of the Brooklyn Bridge. It was a lovely walk albeit cold and windy, and there were many great spots to stop and take photos. 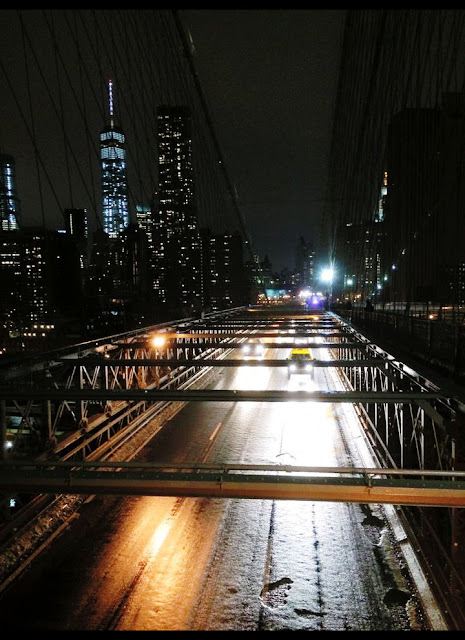 Once you got to the wooden plank section of the bridge, it became a little slippery with the snow, so I would advise caution if you are attempting this during the winter with kids. There were also a lot of friendly tourists walking along, as well as police officers equipped with their very own tiny police vehicles made to fit on one side of the walkway. That was adorable! 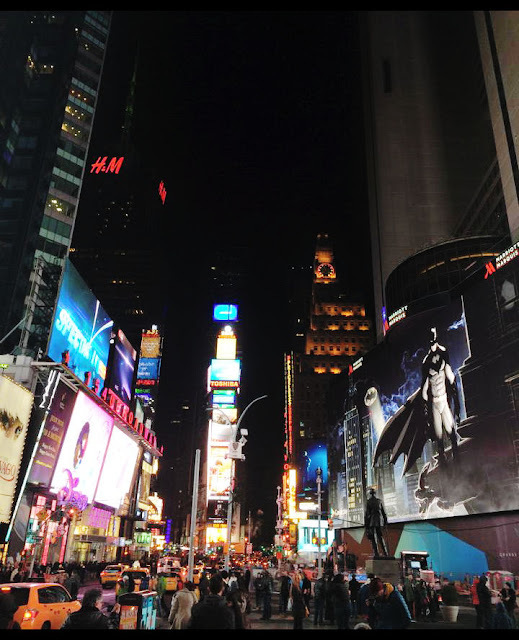 We decided it was too cold and too far to walk the entire length of the bridge, so we got halfway, took some photos, and headed back to the subway for our final destination of the day: Times Square! Then he looked at me while we were walking by. That made me chuckle but Rayyan and I were too busy taking in the view and everything happening all around us. There are tons of stores that are too many to name, a lot of them are quite expensive but a few were worth a visit, like the M&M World with all sorts of souvenirs and different types of M&Ms you could buy and try out. After a jam-packed day commuting all over the city, we picked up some plates of Halal Guys Chicken & Lamb (review coming soon!) and headed back to our hotel to rest up for our final day in NYC. Part 4 - The Rockerfeller Center, Comforts of Home, and Airport Lounge Experiences. 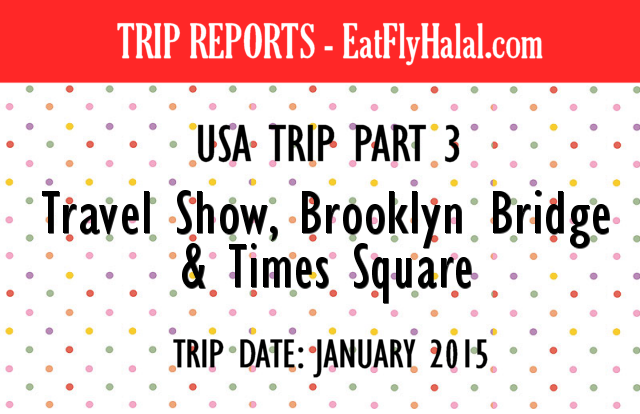 Don't forget to Like the Eat Fly Halal Facebook Page for updates, and cool articles and links to travel ideas, restaurants, and other interesting tidbits.